Check out how you and Backbone are working together across the country. What awesome action can you imagine next? Let's make it happen together. We here at Backbone want to keep you updated on the latest happenings, opportunities for action and reports on the great work you and others are engaged in. Read our bi-monthly Newsletter for a quick summary of many actions that have happened in the first part of April. 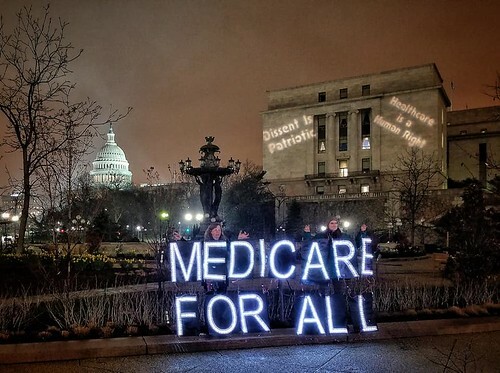 AND if you'd like to see buildings across the US light up with messages to your Reps to do their part to end gun violence, or create single payer health care for all, please make a donation here today. A small team deployed to PSE's illegal construction site in Tacoma to project on the tank for their proposed LNG terminal. Team Backbone went to DC for HOPE's Single Payer Action Camp! We marched down the streets of DC dragging the ball and chain that is this nation's healthcare system. There was an intense debate with Capitol Hill police about whether we would be allowed to finish our projection. In the end we succeeded! Camp was closed out with a visit to Bernie Sanders office to share with him why his healthcare bill needs to be even stronger. The giant ball and chain was drug through DC to raise alarm about exponentially increasing student debt and to call for student loan justice. We launched a petition to protect treaty rights. People turn to us for action support and imagery because we excel at making progressive values visible in these dark times. We get almost zero foundation support and only have enough funds to last till June. If you're excited about Backbone's brand of artful activism and want to fuel more actions like these, NOW is the best time to make a donation here. We literally can't do this without you! Can we count on you to pitch in today? An inflatable globe will be on display at Vashon's Earth Day event. An inflatable pipeline is headed to Lowell, Massachusetts for an Earth Day parade action about a local fight with National Grid. Another inflatable pipeline is headed to Portland for a Chase Bank Action. Wednesday Art Build to produce more flexible LED light panels, new monarch butterfly imagery for immigrant rights actions, banner toolkits and more! Check out our Recent Actions blog to read about more awesome actions by Backbone's Solidarity Brigade teams around the country. Can you pitch in today so more actions like these can happen, across the US? If you want more actions like these, PLEASE make a donation here. Being the Nation's Prop Library for Progressive Activism requires a monthly budget for supplies, organizing, warehouse rent, imagery shipping, and more. We're all in this together, and we cannot do this without your support. Join the Lumbar Club by making a monthly recurring donation. Signing up makes it easy to keep vibrant actions happening across the country; donors like you contribute anywhere from $5/month to $200/month! Whatever fits into your budget will help get more lights, banners, and GOBOs into the hands of change agents everywhere. Together, we can transform crisis into opportunity and despair into hope by taking impactful action on the issues we all care about. And action by action, we'll build the world we aspire to create. Lighting up the Night, and Enlivening the Streets - how you and Backbone are working together across the country. What awesome action can you imagine next? Let's make it happen together.